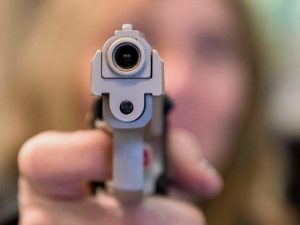 The .357 Magnum was developed in 1934 through the collaborative effort of Elmer Keith, Philip B. Sharpe, and D. B. Wesson of Smith & Wesson and Winchester. Although the effort was a collaboration, experts tend to give the lion’s share of the credit to Keith, an Idaho rancher, writer, and firearms enthusiast. Based on the S&W .38 Special, the .357 was intended to compare to Colt’s .38 Super Automatic. In the mid-1930s, the .38 Super Auto was the only American cartridge with a Muzzle Velocity over 1,000 FPS and the ability to penetrate automobile glass and vests that were often used by gangsters and bootleggers. The .357 was able to outperform most revolver cartridges on the market and quickly became the caliber of choice for law enforcement. 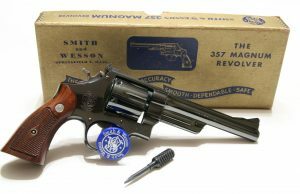 In fact, D. B. Wesson wanted to use the .357 to reassert the company into being the premier law-enforcement armament provider. Wesson, along with the technical assistance of Phillip B. Sharpe, tweaked Keith’s original design only slightly to differ it from the .38. Sharpe was a member of the NRA’s technical division. The introduction of .357 ammo heralded the beginning of the “Magnum Era.” The dual purpose cartridge is regarded by experts and used most often for target shooting, hunting, and self-defense. Remington’s HTP .357 Magnum SJHP is an excellent round for self-defense. The hollow point, 110 grain bullet fires at a Muzzle Velocity of 1,295 FPS. New to the market, it is crafted with non-corrosive brass casing and premium Boxer primer. This cartridge offers excellent high terminal performance, delivering maximum accuracy, and instant-stopping power with proper shot placement. Manufactured by Federal American Eagle, this 158 grain JHP bullet allows for deep penetration along with great expansion capabilities. Touting a velocity of 1,240 FPS and Muzzle Energy measuring 539 ft. lbs., it is the best ammo for self-defense, hunting, and range training. Note: In small weapons this cartridge has significant recoil which can be tempered by using a larger weapon. Manufactured by Federal American Eagle, this reloadable 158 grain JSP bullet is similar to its the JHP offering in terms of velocity and Muzzle Energy. It is among the best .357 ammo for self-defense, wild boar and deer hunting making it ideal for multi-purpose use. Note: In small weapons this cartridge has strong recoil which can be remedied by using a larger weapon. Magtech’s dedication to innovation and ability to produce quality ammo has given them a strong standing in the marketplace. The reloadable 158 grain, semi-jacketed soft point .357 Magnum bullet is manufactured with brass casing and Boxer-primed. It is known for accuracy with a Muzzle Velocity of 1,235 FPS and Muzzle Energy of 535 ft lbs. It is ideal for multi-use including self-defense, plinking, and range work. The Tula Cartridge Works was founded in Russia in 1880 and is one of the chief ammunition manufacturing plants in the world. Tula has gained a strong reputation for delivering an economical, rugged, and reliable product. Tula’s .357 Magnum 158 Grain FMJ is at the top for the best .357 target shooting round and a good training round. Great for range training, it shoots at a Muzzle Velocity of 1,280 FPS. One downside might be that the steel casing doesn’t always make it easy to eject. Fiocchi Shooting Dynamics is a European company that has developed a stronghold in the marketplace by providing innovative, high quality products. 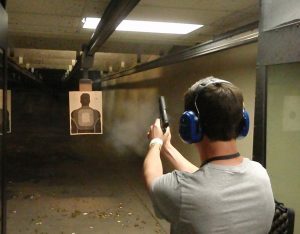 This .357 Magnum 142 Grain round shoots at a Muzzle Velocity of 1,420 FPS. This new production ammunition is brass-cased, reloadable. non-corrosive, and Boxer-primed. Affordability, reliability, and high level of accuracy at long distances put it at the top for the best .357 ammo for the range. CCI is known for manufacturing some of the best .357 ammo in the marketplace. The aircraft-grade aluminum casing paired with a Speer bullet and CCI primers gives this round excellent accuracy on the range. Its hard metal coating atop the hollow point bullet helps to increase the ammo’s strength as well as thwart fouling in the barrel. It shoots at a Muzzle Velocity of 1,150 FPS, with a Muzzle Energy measuring 464 ft. lbs. In addition to range shooting, the CCI Blazer .357 bullet works equally well when hunting large game.